Looking south into the gateway of Rock Creek. In the heart of one of the world’s last intact ecosystems, and just minutes away from Missoula, the cold and clear waters of Montana’s first blue ribbon trout fishery, Rock Creek, join the Clark Fork River. Here, open meadows and meandering rivers on the historic 300-acre Corra Ranch have served as a gateway to Rock Creek for over a century, welcoming visitors and residents to the renown valley that stretches south to the Pintler Wilderness and the Continental Divide. 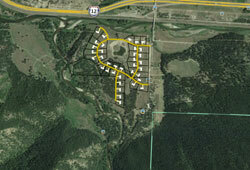 In the mid 2000's a 36-unit subdivision was proposed for the site, which threatened to forever change the character of the valley and cut off public access to miles of rivers, streams, and adjoining National Forest. With financial help from a broad group of public and private partners, Five Valleys purchased the property in 2012, and began restoring the property and developing publicly accessible trails to the creek, river and forests. In order to prepare the land for a large subdivision, bulldozers and backhoes had dug up much of the open meadow and created a gravel berm that blocked the view looking toward the canyon. The disturbed areas soon sprouted weeds and discharged sediment into the Clark Fork River. Since purchasing the property, Five Valleys has worked with many partners to restore it. Partnerships with Missoula College and the University of Montana have resulted in the removal of the berm, recontouring of the site, and development of a revegetation plan. Five Valleys staff and volunteers have native planted grass seed and installed a temporary irrigation system to support these grasses as they establish. 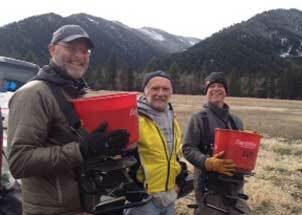 Volunteers helping with reseeding efforts. In 2016, the developed pond was recontoured into a shallow groundwater wetland that can accommodate floodwaters from the Clark Fork River. Over 300 native shrubs were planted in this riparian area in 2017, augmenting the organic revegetation that is underway throughout the meadow and along the streams. Throughout the property, the never ending fight against weeds is underway. 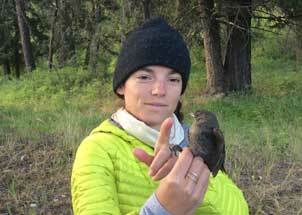 A UM researcher at the Confluence's bird banding station. Thanks to Five Valleys' many partnerships, thousands of visitors are enjoying trails along the rivers, abundant bird habitat, and outstanding fishing. Area school kids are using the property for natural history education, and the University of Montana continues to use the property as an outdoor classroom. 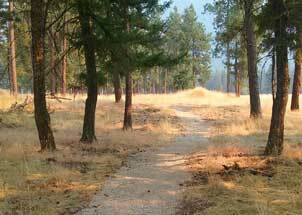 With help from the Montana Conservation Corps, Missoula Parks and Recreation and hundreds of volunteers, the east side of the property is now home to a public walking trail and parking area. In May 2013, Five Valleys acquired and added 2 ½ miles of Clark Fork River frontage on the east side, which includes beautiful cottonwood galleries and the bed of the old Chicago, Milwaukee & St. Paul Railroad. 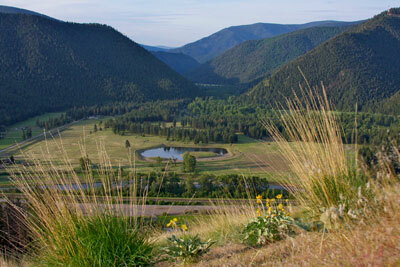 On the west side of the property, though partnerships with the Missoula College Heavy Equipment Operation Program, a local Eagle Scout and volunteers from a church group, the property now boasts a parking area and 1/3rd mile wheelchair-accessible trail, a rarity in our rugged western Montana landscape. Interpretive signage for both sides of the property is currently under development. The west side's wheelchair-accessible trail. In addition, with the purchase of the property, Five Valleys became the owner and manager of the Rock Creek Confluence Cabin, which is available to rent on Airbnb, year-round. We hope you'll drop by and enjoy the trails and ample room to roam. But we also ask that you help with restoration efforts by staying on trails, and are courteous to our neighbors by respecting their privacy and property. Thank you to our project partners, including: The State of Montana, Missoula County, Westslope Chapter Trout Unlimited, Missoula College, University of Montana, Missoula County Weed District, Montana Fish and Wildlife Conservation Trust, Confederated Salish and Kootenai Tribes, Montana Natural History Center, Clark Fork Coalition, City of Missoula Parks and Recreation, and Five Valleys Audubon.